Have you been asking around for the best inter-bank transfer services from your colleagues and those related to banking channels? In general, inter bank transfer refers to a special banking service that helps people send funds through electronic means to Indian bank accounts. There are two ways of going about the act – RTGS and NEFT. This article aims to throw light upon these two means of electronic inter-bank transfer systems to help you decide the way forward in different circumstances. 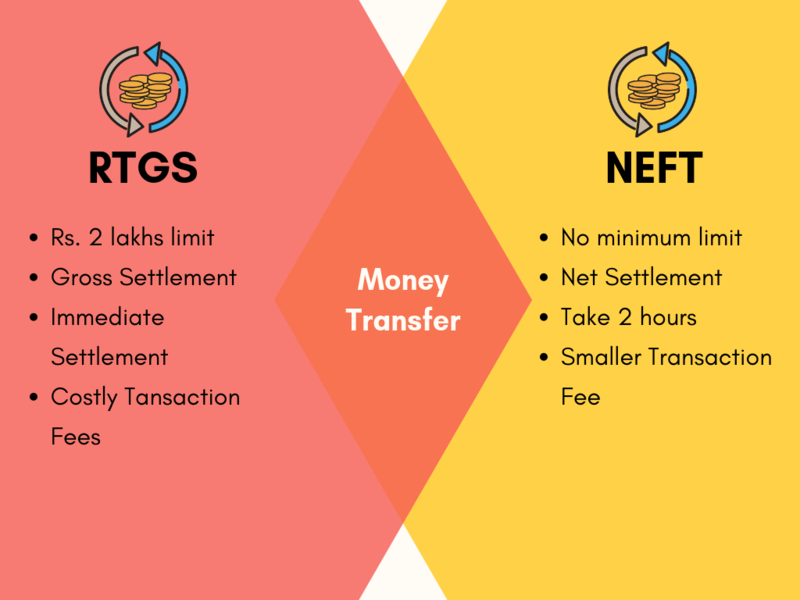 Read on to know more about NEFT and RTGS as well as their differences in details. RTGS is carried out immediately and is based on gross settlement. Gross settlement refers to a transaction that is completed on a one-to-one basis. It is not bunched with other transactions. NEFT is based on net-settlement. Deferred Net Basis (DNS) or net-settlement refers to a transaction that is completed in batches and at specific times. In case of NEFT, all transfers are likely to be held up until a specific time. This causes NEFT transactions initiated after the last cycle to be processed the next day. RTGS transactions involve big amounts of cash. A minimum of Rs 200,000 may be transferred through this system. It is a better means of electronic funds transfer to use in an emergency. NEFT transactions may be of any amount below Rs 200,000. It is used for transferring smaller value amounts. Both the sender's and beneficiary’s account have to be RTGS-enabled. Though most Indian banks are participants in the RTGS transfer network operated by RBI, eligibility pertaining to the access to RTGS payment system has to be verified for specific banks. NEFT transactions can be settled and initiated from the sender’s bank account to any other bank account across India. Costly transaction fees due to faster settlement speed and transfer conducted on a one-to-one instruction basis. A smaller fee is applicable on NEFT transfers and individuals can carry out online fund transfers in a cost-effective way. RTGS transactions can be done online and via bank branches. For online transactions, the bank will charge up to Rs. 10 + GST. Rs. 56 is chargeable for RTGS transactions done via the bank branches. NEFT can be availed at the bank branches and online. The NEFT transaction charges will be different in either case as per specific bank branch policies. RTGS is best defined as continuous fund transfer with its settlement taking place in real time. In other words, if you opt to transfer your funds via RTGS then the amount specified will be moved on a gross basis (on a one-to-one basis and not clustered with any other transaction) from one bank to other in real-time. Here, the term real-time means that the movement of funds is not subjected to any waiting period and takes place instantaneously. The RTGS can be done basis an order by order mode without netting (on an individual basis). It is considered to be the fastest means of moving funds electronically. What is the Full form of RTGS? RTGS means ‘Real Time Gross Settlement’. An important point to note is that a RTGS transfer is irrevocable and final as the transaction reflects in the accounts of RBI (Reserve Bank of India) instantaneously. You can initiate a RTGS transaction only during a specified number of hours and on working days only. The banks with core banking features are exclusively eligible to conduct this transaction. NEFT is defined as an electronic funds transfer mode that facilitates the movement of funds on a one-to-one basis – from and to any bank in India. NEFT transactions allow firms, corporates and individuals to transfer funds through online means in a quick, transparent and easy manner. The transfer of funds can take place from the sender’s account to that of the recipient’s (beneficiary’s) bank account participating in the system. The recipient account may be in a different branch of the same bank or any other bank branch in the country. What is the Full Form of NEFT? NEFT means "National Electronic Funds Transfer". This system of electronic fund transfer was launched in November 2005. All Indian banks that are full members of RTGS are a part of the NEFT system as per the directive issued by RBI post the discontinuation of the SEFT (Special Electronic Funds Transfer System) clearing system in January 2006.